You might recognize this photo from a blog post last season, but I'm using it again to kick off a photo caption contest. Place your best caption in the comments and the winner will get something....don't know what yet but something cool! Pa pa pweeeeese don't do dis ta me! 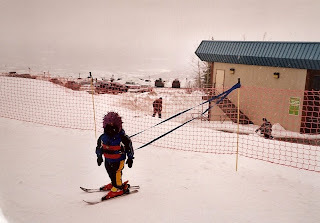 Another new feature at Powderhorn for 2009, the Ewok restraint system. So these are the lessons my parents are paying for?? The lifts were broken, so the backup slingshot was deployed. Just wondering? Who won the prize?